Design must have something to do with it. The body of the Momentum True Wireless earbuds is noticeably beefy, the size of a small chestnut. On the outside of each bud there’s a touch-sensitive area for controls (play, pause, skip track, Siri, and so on), and then on the other side is the bud itself, which contains a 7-millimeter driver. There are also microphones on the earbuds that handle audio for phone calls as well as some noise canceling. The earbud itself is the size of a small chestnut which is just slighter larger than a Cheez Ball. It’s worth highlighting here that these aren’t noise-canceling headphones in the same way that, say, the Sony 1000X series are noise-canceling headphones. Rather than block out the outside world like those ear muff-style can, the Momentum True Wireless seem to use more basic noise-canceling technology to improve the listening experience. You’ll still hear a muffled version of your surroundings, and you can flip the earbuds into “transparent mode” in an accompanying app so that you can better hear what’s happening around you without removing the earbuds. The app also has an extremely simple equalizer feature and a very handy home screen that shows you the battery levels in each earbud. Speaking of handy, the Momentum Truly Wireless connect to devices impressively well. It happens as soon as you take them out of the case, and the voice of an enthusiastic British woman announces it—“Connected!”—so there’s no fumbling around in settings to figure out where your music will start playing. I’d compare the experience to Apple AirPods in terms of pure convenience, although the Sennheiser earbuds sound much, much better. The only other truly wireless earbuds that really compete with the Momentum True Wireless earbuds in terms of sound quality are the Master & Dynamic MW07. Also priced at $300, these more fashion-forward earbuds have bigger 10-millimeter drivers, and the bass sounds a bit more jacked up, which means you lose some detail on certain songs. The Master and Dynamic MW07 (left) has a 10-millimeter driver, and the Sennheiser Momentum True Wireless (right) has a 7-millimeter driver. The MW07 design also means that the earbuds perch on your ear for a looser fit. I like how the Sennheisers fill up my concha, that little cavity between the outer ear and the ear canal. However, it’s worth pointing out that the somewhat bulky body of the earbud might not work well for people with small ears. 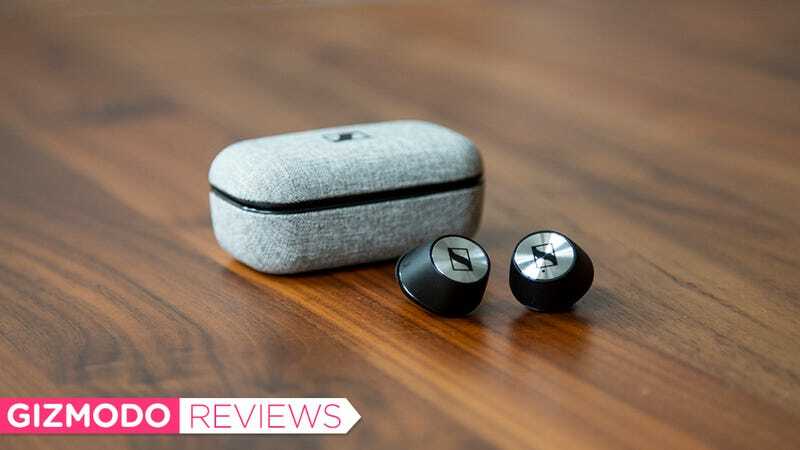 Gizmodo’s resident small ear-haver, senior reviews editor Alex Cranz, tried out the Momentum True Wireless, and the earbuds just fell out of her ear. 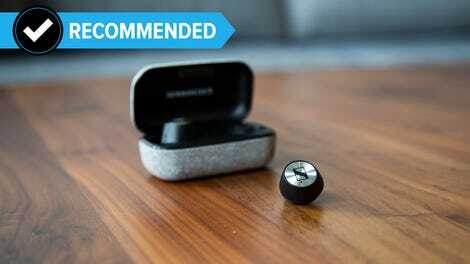 So, if possible, you might want to try on the Sennheiser buds before buying them. Since we’re comparing earbuds, it’s also worth highlighting some usability issues with the Momentum True Wireless. The earbuds have no buttons. The touch-sensitive silver surface on the earbuds is the only way you can control them, and it takes a little getting used to. At first, I found myself accidentally beckoning Siri every time I took them out of my ears but eventually learned to grab them from the sides. This is a problem that I don’t have, for instance, with the $170 Jabra Elite 65t, which have three buttons as well as a handy little microphone arm that makes the earbuds easy to adjust when they’re in my head. The round Sennheisers just take a little more finesse to get them in just right. The Momentum True Wireless earbuds sure do fill up an ear. If you’re just looking for the best-sounding truly wireless earbuds, though, these Sennheisers offer a tremendous proposition. Assuming they fit your ears and you don’t plan on getting them wet, the Momentum True Wireless offer excellent audio fidelity in a delightfully tiny package. It will cost you, too. At $300, the Momentums are on the upper end of the truly wireless earbud price spectrum. But good sound costs money. The included charging case is covered in a smooth tweed-like fabric and provides 12 total hours of battery life.